Brown is one of the richest and warmest colors. It can also be very elegant and sophisticated, without the harshness of black. Used as a main color scheme or in combination with another color, brown is a wonderful choice for a wedding color palette. The color brown actually has many great variations. There is deep espresso, warm milk chocolate, and light mocha - that sound delicious, doesn't it? The lighter shades of brown are lovely for an afternoon wedding, and the deeper tones are perfect for the evening. Brown is also a color that can be used in conjunction with many other colors. For weddings, espresso brown is often added to pink or sky blue to give those colors a sophistication that they would otherwise lack. A very fresh and modern wedding palette can be created by mixing brown with lime green, and for an opulent look, try using chocolate with copper. The bride and bridesmaids' attire will set the tone for the wedding, so this is a good place to use your brown accents. Brown makes an excellent choice for the bridesmaid dresses. A brown dupioni or satin is gorgeous for weddings year round; for a winter wedding, indulge in luxurious chocolate velvet. You can also have wedding jewelry handmade to coordinate as your bridesmaid gifts. Sparkling Swarovksi crystals in chocolate would make a beautiful accent to brown bridesmaid dresses. Create necklaces and earrings that combine the brown crystals with clear ones to keep the look from getting too heavy; the effect will be stunning! The bride herself will probably not choose to wear a brown dress (although I did know one winter bride who did), but there are many great ways to use brown as an accent color for the bride's ensemble. One of the prettiest ways is to add a sash in a shade of brown to the bridal gown. If you want something subtle, choose a pale mocha, or be bold and wear a deep espresso sash at your waist. Another place that the bride can add a dash of color to her ensemble is in her jewelry. 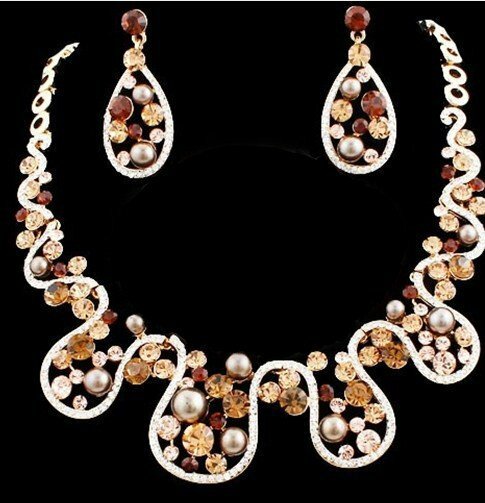 Handmade wedding jewelry created from warm mocha colored pearls makes a stylish alternative to the classic white pearl bridal jewelry. A nice thing about mocha pearls is that they will be very easy to mix into your regular wardrobe after the wedding. 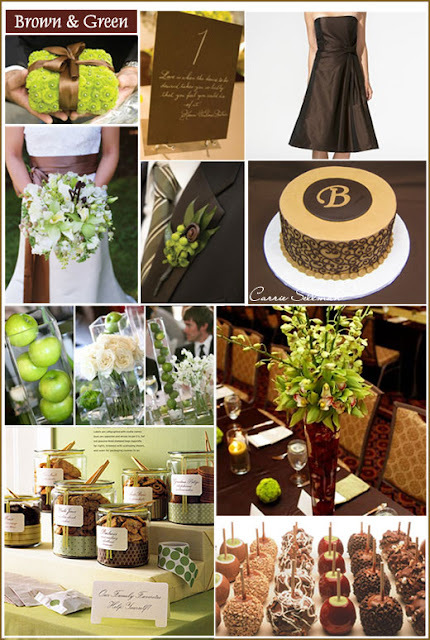 Brown can be used in many additional parts of the wedding. A stunning brown flower is the chocolate cosmo, which actually has a soft chocolatey aroma. 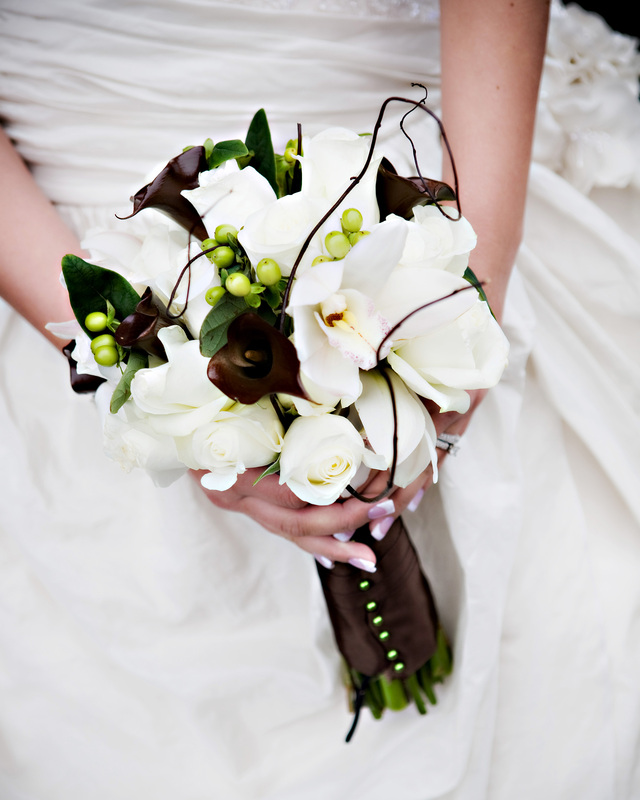 For brides who prefer white or ivory bouquets, ask your florist to tie them with a chocolate satin or velvet ribbon. 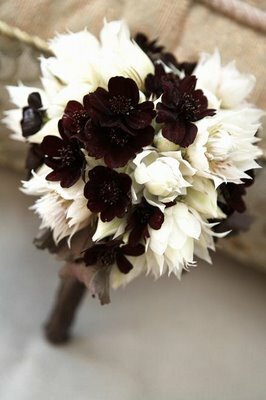 The deep brown ribbon will pop nicely against the lighter color of the flowers. A brown ribbon would also work very well with a pink bouquet, for a pink and brown themed wedding. 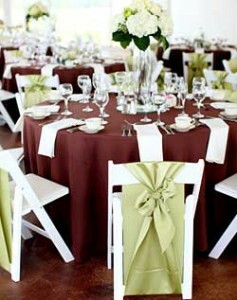 For a very elegant effect at your reception, look for tablecloths that are trimmed with a brown band near the hem. The crisp brown stripe against a lighter cloth has a great graphic effect that is very chic. Another great idea is to use espresso brown napkins over a sold tablecloth. They will really pop against a blue, pink, or gold cloth. Do be careful about using brown napkins with ivory tablecloths, though, because it can end up looking a bit drab. One of the most versatile colors that you can use to decorate your wedding is brown. It is a great choice to add sophistication or to tone down a very feminine color scheme. Brown is one of those colors that can be worked into almost any wedding to great effect.